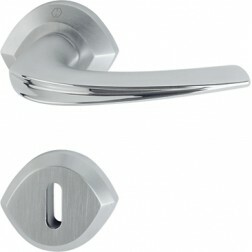 Interior door handle Hoppe Monte Carlo series on round rose. Hoppe door handle Monte Carlo series is robust and luxurious. It is constructed with solid brass. The components of this handle have been intended to last for more than 10 years. The installation has been speeded using the quick-fit connection by Hoppe. Bicolor finishes are protected by a guaranteed surface up to 10 years.